Make an instant statement with this shimmering bangle! 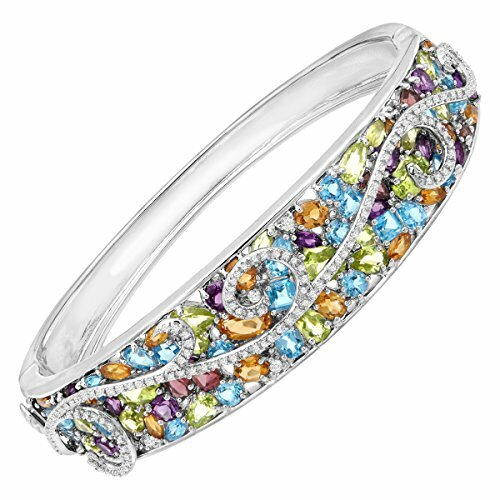 Featuring 13 3/4 ct of round, oval, and pear-cut amethyst, Swiss blue topaz, white topaz, peridot, citrine, and pink tourmaline, this glamorous bangle is accented with sterling silver vines across the face, holding a total of 3/8 ct round-cut diamonds. Piece measures 6 3/4 by 5/8 inches. If you have any questions about this product by Finecraft, contact us by completing and submitting the form below. If you are looking for a specif part number, please include it with your message.